One more festival of sharing and prosperity has come to visit us, so we will enjoy it with great fun. In Kerala, southern part of India it is celebrated as Vishu a Harvest festival, in neighboring Tamil Nadu it is celebrated as Tamil New Year and in Punjab it is celebrated as Baisakhi and in Assam it is celebrated as Bihu. During Vishu ( April-May, this year April 14th), Laburnums flowers starts to bloom, glittering everything in beautiful yellow, even a special variety of cucumber shows off its skin in beautiful yellow, gold coin everything related to Vishu is bright yellow as sunshine. In Kerala, Jack fruit, Mango, Cashew trees are in full form starting to share their crop from top to bottom. Vishu brings me a lot of nostalgia, waiting for the coins which appa gave us in the form of Vishukainettam. In the early hours of the morning we get up to see Vishukani. And we pray to God to keep us safe, happy and prosperous. And a yummy feast follows in the day. If you want to read ritual about Vishu, read here and here. Vishu is unique festival compared to Onam our main festival as latter is celebrated everywhere, in home and outside (like office, public places) where as first one is only celebrated in home. Even southern and northern part of Kerala has its own difference in celebrating Vishu. In South, there will be, Vishukani ( (First thing seeing in the morning ), kaineetam (coin giving to younger ones by elders as a simple of sharing the prosperity) and feast, where as north it is celebrated with all these along with fire crackers. This Vishu is extra special, as it is my Prince Nikhil’s first vishu. So I am planning to keep Vishukani and have a feast. Since my hubby is off for Friday I think I can make it with less hassle. It will be crazy; still I am going to make it. For celebrating Vishu I made palpayasam, which is simple but delicious. We make this Payasam or pudding for marriage, feast or as offering in the Temple. Especially Amabalpuzha palpayasam is very famous in Kerala, India. This is offered to Lord Krishna as a debt pay back by a king. Story behind that offering that, once Lord Krishna appeared before a king who is chess enthusiastic and was willing to play the game for few grains. King as happy and readily accepted the prize, but in the game he lost to God and when realized that it was not a few grains, he had to give but according multiplication of numbers in checkerboard. He didn’t have enough grain to give him. God told him, no problem he can pay back as palpaysasm as daily offering in the temple and it should be distributed freely to all his devotees. I read somewhere, now Payasam is not served free, it is sold. 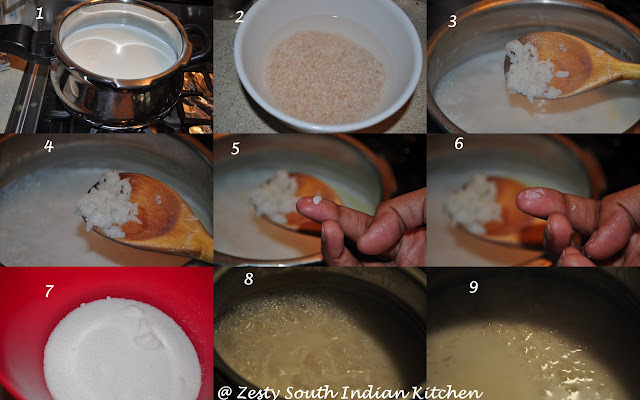 Palpayasam is easy to make. You need to cook the rice in milk and then add sugar. This Payasam doesn’t have any add on like cashew nuts, raisins. It is not even flavored with any spices. Here goes the recipe. Wash rice with water and set aside. Heat 1 tablespoon of Ghee in thick bottomed vessel. Add water and milk together and when it reduced to 3/4th add washed rice and cook until is 3/4th done, rice should hold the shape it takes about 20 minutes. Stir in between so that rice won’t stick to the bottom of pan. Then add sugar and cook for another 9 minutes or until milk reduced again and there is pink color change. Stir in between here also to prevent sticking at the bottom. Switch off the flame once rice is completely cooked. And serve once it is cold enough to touch. Rice, Parippu curry ( Lentil curry), Sambhar, Aviyal, Amarakka Thoran (Guvar/ Cluster beans stir fry with coconut), Pineapple Plantain Pachadi, Okra kichadi, Banana chips, Sarakaravaratti,, Payasam, Banana, Mango pickle and Papadam ( Indian Wafers) ( for recipes take a look at here) . Happy Vishu wishes to you and family Dear!!!!! A perfect recipe for the perfect day. Happy Vishu to you too.. Delicious payasam…loved the traditional serving dish. Nice post…Wishing you and your family a happy Vishu. oh my gosh this sounds so good, I have missed so many of your posts , I’m playing catch up, lots of yummy reading here! One of my favorite payasams, very perfectly done..
Hi Swathi happy Vishu to you and your family. Yummy payasam looks delicious in beautiful Urli. Happy Vishu and the payasam looks yummy. Happy Vishu wishes to you and your family Swathi..Rich looking super creamy payasam..
Payasam look superb. Happy Vishu wishes to you and your family Swathi. i love payasam too. looks so yum! Happy Vishu to you too! Yummy and creamy payasam… Happy Vishu to u dear!!! Happy Vishu to you too. I was wondering what payasam rice is. Is it long grain rice? I love pal payasam and make it often. This is a new way of preparation. Thanks for sharing. Payasam rice is raw rose matta rice, available in Kerala.